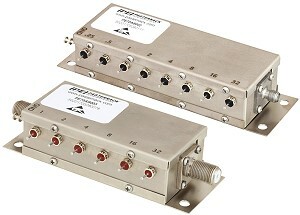 Irvine, California - Pasternack, a leading provider of RF, microwave and millimeter wave products, has released a new series of relay controlled programmable attenuators. Typical applications include signal conditioning and level control, matching impedances of sources and loads and measuring the gain or loss of two-port devices. Pasternack's six new models of relay controlled programmable attenuators cover broad frequency bands from DC to 2000 MHz with attenuation levels ranging from 0 to 127 dB. Depending on the model, attenuator designs have 6 to 8 relay bits with attenuation steps ranging from 0.25 dB to 64 dB for precise tuning capability. Typical performance includes low insertion loss ranging from 0.8 to 3.5 dB, attenuation accuracy of +/- 0.5 dB and input power up to 1 watt CW. For added convenience, models are offered in 50 and 75 Ohm configurations and feature bidirectional performance capability. These attenuator assemblies are oHS compliant and available in rugged nickel-plated brass packages with either female SMA or F-type connectors. Each relay bit has a designated RFI pin with a DC bias of +12 Vdc and 15 to 30 mA depending on the model. All models are export-rated as EAR99 and have an operational temperature range of -20°C to +85°C. "Pasternack's comprehensive selection of relay controlled programmable attenuators provides designers with the precisely controlled attenuation step sizes desired for signal conditioning and testing applications. For added convenience, all models are available in rugged connectorized packages and are in stock and ready to ship," said Tim Galla, Product Manager at Pasternack. Pasternack's relay controlled programmable attenuators are in stock and ready for immediate shipment with no minimum order quantity. For detailed information on these products, please visit Pasternack's website.